These plotting scripts assume you know the correct parallels, meridian, and corners of the rcm2 model domain you are working with. This information is REQUIRED to correctly plot the RCM because it is on a native Lambert Conformal grid. For discussion of this issue, we have a page devoted to native grids. WARNING: The users of this model could not provide us with the correct values of the parallels and meridian. Through trial and error, we have chosen values that roughly matched the data to the map. This is not precise. If you are using the RCM, you must determine these values to correctly display your data. The examples below are provided to show the code required. 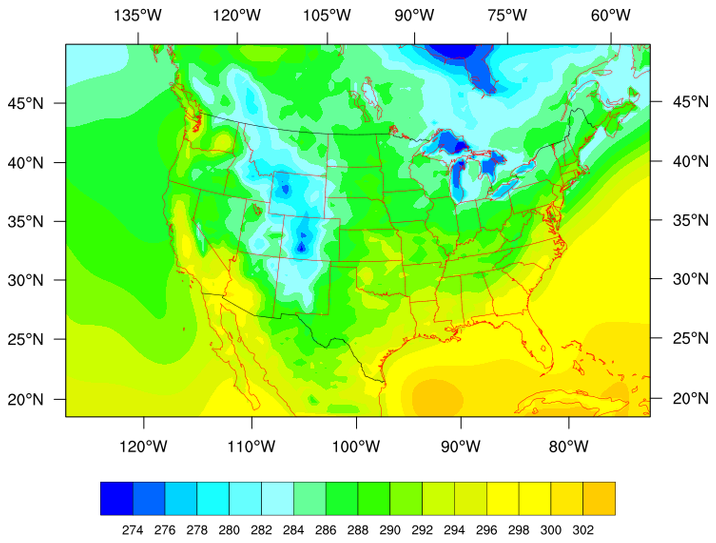 Noah Diffenbaugh and Mark Snyder have created a website dedicated to visualizing RegCM3 output using the NCAR Command Language (NCL). We are told that a new version of the model is available for download. rcm_1.ncl: An example of plotting cray binary data from the RCM2 on a Lambert Conformal projection. 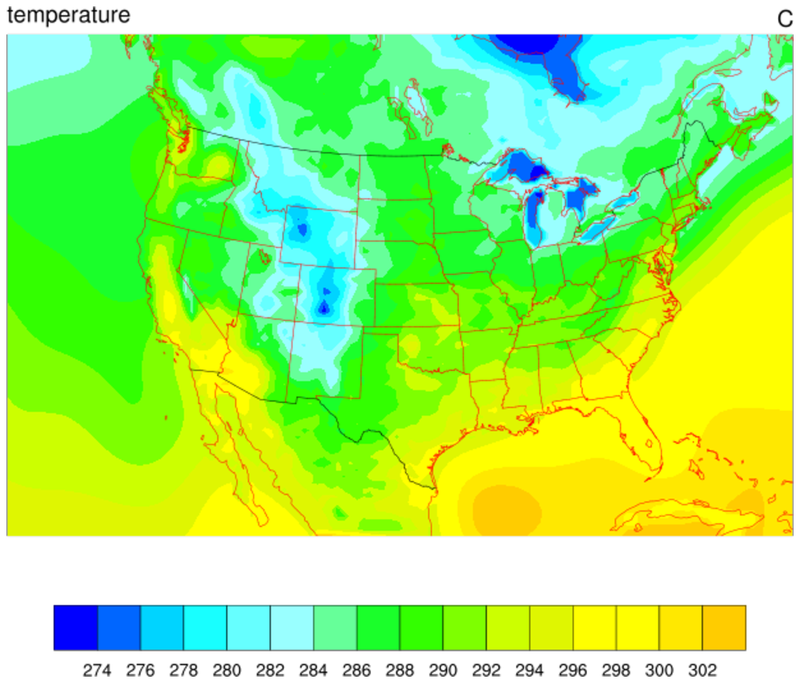 mpOutlineBoundarySets = "GeophysicalAndUSStates", adds state boundaries to the map. mpUSStateLineColor = "red", draws the state boundaries as red. mpProjection = "LambertConformal", chooses the map projection. mpPerimOn = True, adds a perimeter box around the map. rcm_2.ncl: Same plot as example one, but with subtitles. We need to turn off the automatic tickmarks in order to make room for the titles. 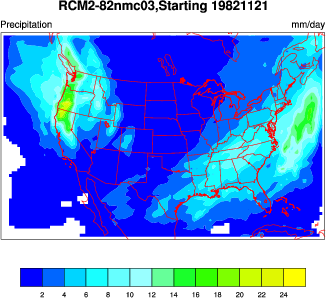 rcm_3.ncl: A color precipitation plot using a netCDF version of the data. Jeff Lee has created a filter to convert the cray cos blocked rcm binaries to netCDF. GO JEFF! If you want to use this filter, copy it to your directory and modify it to suit your purposes. It works on one variable at a time. rcm_4.ncl: A black and white version of example 3, suitable for publication. 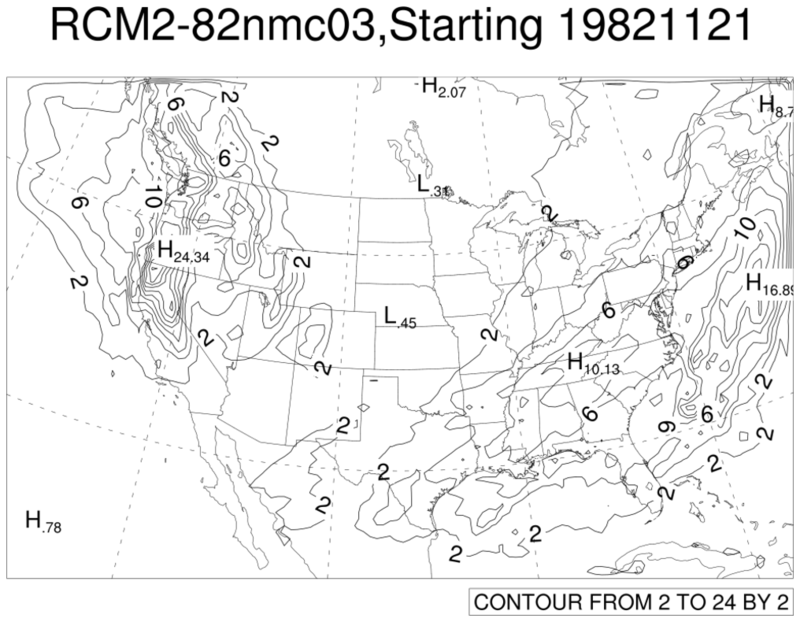 Note that the contours lines have been thickened for better screen viewing. This may have to be removed if plotted. There are other fill patterns to choose from.